Presented by Fast Aviation, the fourth annual Lismore Aviation Expo also includes a huge variety of children’s activities, trade exhibits, food stalls and much more. A flying demonstration from a RAAF Hawk 127. This is the fighter plane that Air Force pilots train in before moving onto Super Hornets. Watch an amazing flyover of this extraordinary aircraft. 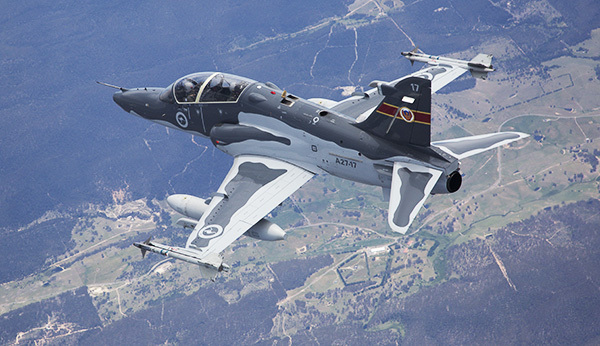 The RAAF Hawk 127 stands at 4.1 metres high with a wingspan of 9.39m, and boasts a Rolls Royce engine. Its top speed is an incredible 1207km/h. Daring aerobatics displays by Paul Bennet Airshows. See old favourites as well as some new planes and high-flying stunts. You will be on the edge of your seat with aerobatic demonstrations from the Sky Aces, parachute drops and more. A range of joy flights and learn-to-fly discovery flights. Indulge your sense of adventure and take to the skies. A range of packages are available including exhilarating rides in WWII Warbirds. Walk-ins are welcome or you can book early to make sure you don’t miss out. Get the best seat in the house from the all-new VIP viewing area ‘The Mound’. This elevated area will give visitors a bird’s eye view of the runway from out on the tarmac. Entry to The Mound is by gold coin donation with all proceeds going to Our Kids. There is no parking on site at the Lismore Aviation Centre except for those with a valid disabled parking permit. Free shuttle buses will run on a continuous loop from two locations. The wait between buses should be no longer than 15-20 minutes all day. Buses can accommodate prams. Bus Stop One: Oakes Oval, Dawson Street (buses will run on a continuous loop commencing at 8.45am from Dawson Street directly to the Lismore Aviation Expo and back until 4pm). Bus Stop Two: Lismore Lake, Bruxner Highway, South Lismore (buses will run on a continuous loop commencing at 8.45am to Lismore Aviation Expo via Lismore Airport Terminal). All flight operators will gladly accept bookings, but walk-ins are also welcome on Sunday. Joy flight bookings and information is available at www.visitlismore.nsw.gov.au. For more information on the expo and highlights of the day visit www.visitlismore.com.au.